The widespread adoption of the Internet has led to the explosion of online services, and consequently the explosion of hosting companies. Distributed denial of service (DDoS) attacks have become the mechanism of choice for cyber criminals to inflict maximum damage against their desired targets. These targets are often customers of unsuspecting hosting companies who are simply trying to providing reliable infrastructure and platform services to SaaS companies, websites, VoIP, mail, DNS, game servers and other online applications. These attacks are widespread and harm the recipients as well as adjacent customers the hosting company supports, and often are strong enough to spill over so far that they impact an entire hosting operation. Malicious criminals have varying motivations, methods, and backgrounds. Some use an arsenal of vulnerable servers to launch distributed denial of service (DDoS) attacks against their desired target. Some use DDoS as a means to levy their grievances against their former host. Some will see this as a means to extort financial gain. Some simply do it for sport. 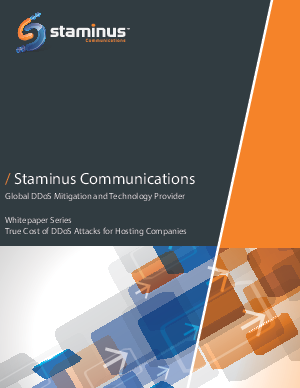 In this installment of a series of white papers about the true cost of DDoS attacks, StamSOC (Staminus Security Operation Center) will discuss the history of these attacks, the wide reaching impacts, and the true costs associated with DDoS attacks. Business operators often overlook the repercussions of DDoS attacks. They look at the immediate damage in terms of bandwidth and forget to look at SLA violations, customer loss, and brand damage. You’ll learn why these attacks are so prominent today.